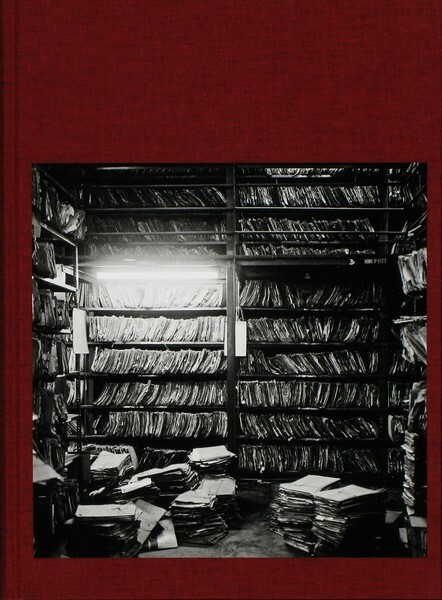 Book Review File Room By Dayanita Singh Reviewed by Nicholas Chiarella Dayanita Singh's File Room is a collection of images documenting record and file rooms in India. Gathered for over a decade, the photographs capture the paper records of factories, government offices, and personal archives. The papers in these archives trace multi-generational court trials, lineages of possession and exchange. Some make recurring journeys to courtrooms, others wait on shelves for decades to prove themselves useful, and all, most likely, will disintegrate entirely. File Room. Photographs by Dayanita Singh. Steidl, 2013. Hardbound. 88 pp., 70 illustrations, 9-1/2x12-1/2". Dayanita Singh's File Room is a collection of images documenting record and file rooms in India. Gathered for over a decade, the photographs capture the paper records of factories, government offices, and personal archives. The papers in these archives trace multi-generational court trials, lineages of possession and exchange. Some make recurring journeys to courtrooms, others wait on shelves for decades to prove themselves useful, and all, most likely, will disintegrate entirely. Life is filled with objects destined for loss or decay. Our abilities to replicate and reflect develop in response to the fragility of these objects. In File Room, archives are revealed as information liminal zones, blurring the edges between storage and hospice care. In these rooms, papers may sit unused for decades until they finally crumble under their own weight, or that of circulating air. A typewriter looks like a death machine, its bearer a dutiful executioner. File Room, by Dayanita Singh. Published by Steidl, 2013. While the stacks wait for use, boxes crumbling into one another, they also assert a critical independence from their potentially-functional existence. Singh's compositions lend a sense of intention to even the most precarious stacks, encapsulating them within strict, even framing. Where aisles end in head-high stacks of paper or against the wall, empty chairs become the sentinels of a labyrinth. In one such intersection, a gathering of small signs chants, "Judicial Department, the Governor General of Bengal in Council, Criminal Branch." A single stack of papers left on the floor attempts the climb back to order. In the opposite image of the spread, the highly-ordered patterns of a tiled floor become a shocking disruption to the otherwise polite decomposition. A bicycle leaning against a row of lockers suggests an outside world that cannot possibly matter anymore, no less novel than the typewriter. The people in these photographs play ambiguous roles: researchers, tour guides, ghosts of children obsessed with sifting. Their stewards are depicted unsurprisingly, with expressions happy or askance or neutral. The images are accompanied by texts from Aveek Sen that provide some narrative direction; veils that feel enmeshed in fact and fiction. Sen's texts personify individuals and interactions suggested by the photographs, moving in tandem with the sequence of images. From Sen's writing, as well as Singh's interview with Hans Ulrich Obrist (which concludes the book), we come to see these archives as improvisations in care and organization. Frequently, only one individual really comprehends the contents and arrangement of a given collection. The boxes, bundles, and exposed stacks demonstrate a mix of reverent placement and quiet mayhem, more than the sentimentality or nostalgia associated with aging collections. The absence of color in the images is made more noticeable with Sen's description of decomposing paper: "As you leaf through the papers in a file, old paper and new paper, white paper and green paper, brittle paper and rough paper, hand-written paper and type-written paper, normal writing and bureaucratic writing, come together to create a mish-mash of colours and textures." The black and white images instill a sense of decay more akin to breathing forest floors. Here, the endless shelves and stacks of aging paper let go of memory in gentle collapse. In one image, sagging bundles wrapped in thin cord fall into one another, small signs noting with unintentional irony, "personal files."